If you are solo you can pay the 2 person minimum and have a private guide! Follow you guides line or take your own. 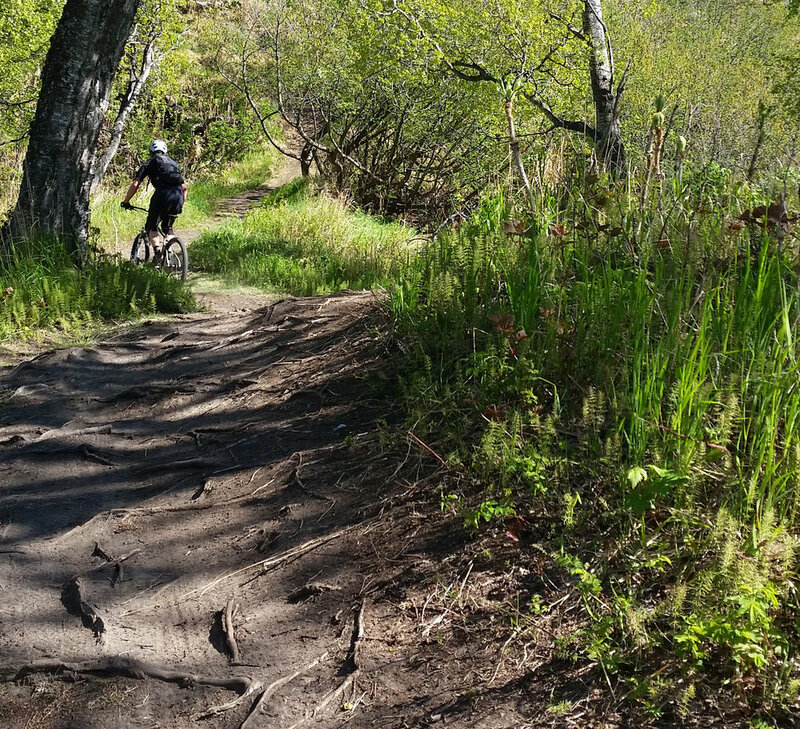 Get ready to drop in on an extensive trail system in Anchorage at Kincaid Park which encompasses 45 miles of trails and singletrack. Get into the zone with dialed in equipment as you bank off berms and take jumps at your comfort level. After a great ride, your guide can take you for lunch and a brew. 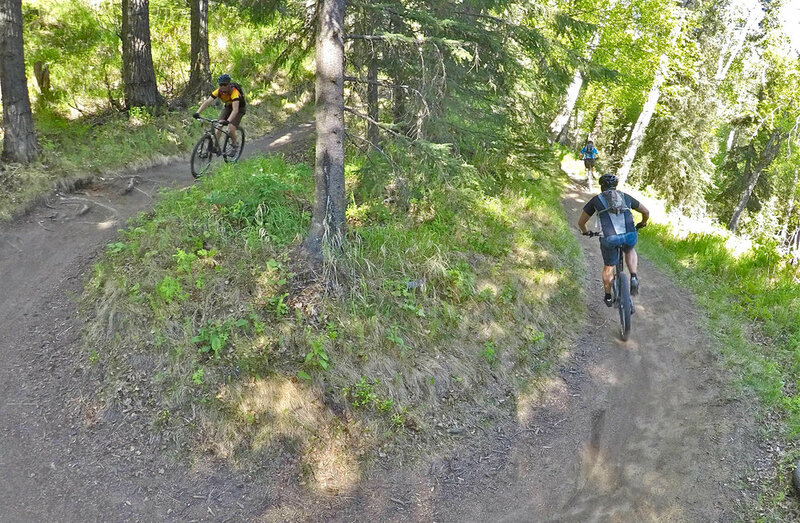 Anchorage is not only home to some of the best singletrack, but also an exploding craft brewery scene. Continue to soak up the personality of Anchorage through a sampling of our craft breweries at possible locations like: Resolution Brewery, Cynosure Brewery, Anchorage Brewery, and Midnight Sun Brewery. This is offered as a custom experience for your group, tailored to your abilities. Contact us with what you are looking for. When you book let us know what your rider skill level is so we can optimized your time with us for maximum fun and trail time! We tailor the difficulty of riding to the overall group ability and try out best to organize groups best on riding levels. The difficult can range from moderate to difficult/expert rider. We require that guests know how to ride a mountain bike and are comfortable shifting gears and using hand brakes. Please see the skill/fitness tab, riders are required to have a minimum skill level of 5 and fitness level of 4/5. This is a great ride for the solo rider, the mountain biking family or for a group of friends who regularly ride together. Please see the rider skill level tab for a detailed description of our rider skill levels. If you are interested in a less technical ride check out our Chugach Mountain Bike Tour or contact us for a private experience. Kincaid Park: 1 - 15 miles, depending on overall group experience. Terrain & Trails: Depends on experience: terrain ranges from wide dirt path to fast winding singletrack. The trails selected will be based on your skill and fitness level to ensure an enjoyable experience. What AKTG provides: Hardtail mountain bike, helmet, lightweight rain jacket, biking gloves. Our bikes do not have clip in pedals. If you prefer a full suspension mountain bike we can provide one for the trip at an additional cost. Alaskan weather is always changing; the day can start out sunny and end in rain or vice versa. We encourage all those coming on our trips to have non-cotton, comfortable clothing. Dressing in layers and avoiding wearing cotton is the best way to be prepared and warm. We recommend checking the weather the day of your trip. Level 1 - - NEWBIE: I can ride a bike, use hand breaks and shift, but I have never ridden a mountain bike before. 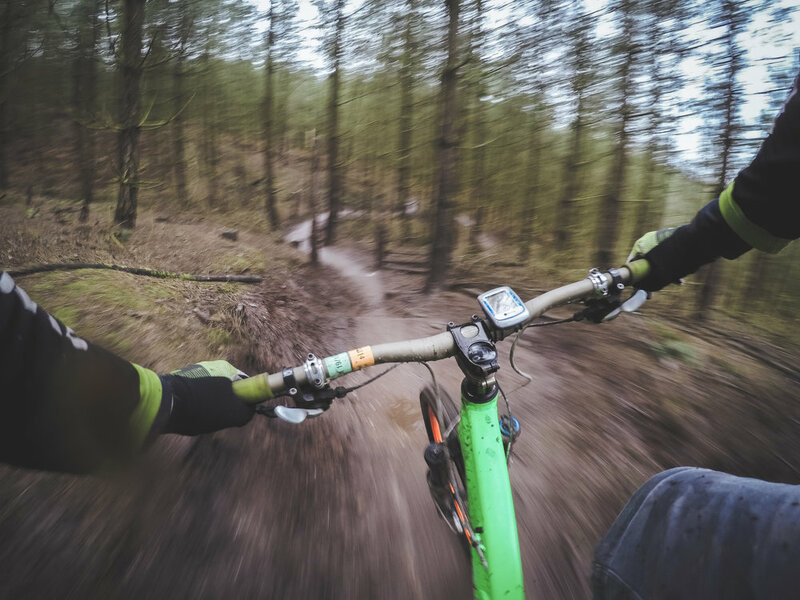 Level 2 - - BEGINNER: I have limited experience and I mountain bike 1 -2 times a year. I am a beginner when it comes to skill, technique and ability. I bike on flat hard packed / dirt trails. Level 3 - - NOVICE: I mountain bike a few times a year. I prefer wide dirt trails (atv trails or doubletrack). I don't yet have the skills and confidence to ride terrain with roots, rocks, tight corners, tight trees Singletrack - what is singletrack? Level 4 - - STRONG NOVICE: I mountain bike a few times a month. I enjoy smooth mellow singletrack. Trees often feel tight, climbs come too quick to shift and I have to walk sometimes, and the obstacles have me a bit surprised. Level 5 - - INTERMEDIATE: I ride a few times a month. I am comfortable riding a variety of singletrack which may include tight trees, mud, loose rocks and sand. I am comfortable and confident rolling over small obstacles (a couple inches high) like roots, rocks and small rollable drops (a couple inches high). I do not take my wheels off the ground. I anticipate the terrain and shift gears accordingly. I am comfortable and balanced standing up off of my seat and can maintain level pedals for the entire descent. I use momentum to climb rolling terrain and am comfortable using both my front and back brakes when required. Level 6 - - STRONG INTERMEDIATE: I ride 2-3 times a week. I am comfortable riding a variety of singletrack which may include tight trees, mud, loose rocks and sand and are comfortable doing so on more challenging terrain. I am comfortable and confident with a front wheel lift and rear wheel lift to get up and over larger obstacles (up to 6 inches) such as roots and rocks that are not rollable. I am confident and successful executing the following bike handling skills on a variety of singletrack: I anticipate hills by shifting gears often and smoothly. I shift my body weight forward in efforts to keep traction on my front wheel when climbing. Descending, I am comfortable and balanced standing up off my seat and can maintain level pedals for the entire descent. I am comfortable with speed and letting go of my brakes as long as I can see the exit or end of the descent. I use momentum to climb rolling terrain and am comfortable using both the front and back breaks when required. I understand effective cornering techniques although still need to work on my timing and coordination. Level 7 - - ADVANCED: I consider myself to be a strong rider. I ride at least 2-3 times a week and rides can be 3-5 hours. I enjoy long climbs and technical features. I'm very comfortable with singletrack which may include tight trees, mud, loose rocks and sand and am comfortable doing so on aggressive terrain with little breaking. I can hop over obstacles such as small roots and rocks that less advanced riders may wheel lift over. I can anticipate the need to shift gears for hills often and smoothly. I use my breaks sparingly and am open to taking some air off rocks and roots. I am comfortable leaning my bike through corners and exit with acceleration. Level 8 - - EXPERT: Mountain biking is a very big part of my life. I ride 3-4 times a week. I love long, arduous climbs over 3,000 feet in elevation gain. I can handle extreme technical trails and I'm comfortable in the air as needed. Level 1 - - NON-AEROBIC: I exercise less than 1 hour a week. The thought of going uphill on a bike is very daunting. I want the easiest, most mellow ride possible on flat, easy terrain! Level 2 - - VERY LOW INTENSITY:I live a fairly sedentary life, with very little activity outside of walking. I can handle a 1 hour bike ride on flat terrain at a relaxed pace. Small, short hills are a challenge, but manageable. I exercise about 1 hour per week. Level 3 - - LOW INTENSITY: I exercise about 2 hours per week. I can ride a bike for 1-2 hours at a relaxed pace, with breaks. I can handle 1 or 2 easy hill climbs of up to 300 feet or so. Level 4 - - LOW-MEDIUM INTENSITY: I try to get regular exercise, up to 2-3 hours a week. I can ride a bike for 2-3 hours at a relaxed to moderate pace, with a few short breaks. I can climb up to 600 feet or so in a day. Level 5 - - MEDIUM INTENSITY: I get regular exercise, up to 4-5 hours a week, including riding a bike. I can go on a 4 hour bike ride at a moderate pace with some short breaks. I'm confident climbing up to 1,000 feet in a day. Level 6 - - MEDIUM/HIGH INTENSITY: I'm really getting into cycling and can ride up to 5 hours at a moderate pace with short breaks. I can climb 1,500 to 2,000 feet in a day. I regularly exercise 5 times a week. Level 7 - - HIGH INTENSITY: I consider myself a pretty fit athlete and I exercise on average 7-8 hours per week. I can ride 5-6 hours a day at a moderately fast pace with a few breaks. I can handle a ride with 3,000 feet of climbing. Level 8 - - VERY HIGH INTENSITY: I consider myself a strong endurance athlete and I get a very regular, intense exercise for up to 10 hours a week. I can ride up to 7 hours a day at a fast, steady pace. Long climbs, up to 4,000 feet, are not a problem for me. Level 9 - - PROFESSIONAL: I am a professional athlete or cyclist and ride for long days on end.